I'm attempting to display a View Block with a CiviEntity (type: CiviCRM Case) on a Drupal Node using Display Suite (block field). When I set up the Display Suite Block Field, I'm presented with options for the type of entity, if I choose any of the Civi Entities (Civicrm Case, Civicrm Contact, etc.) they will not show up in the 'Manage Display' section of node setup. Is there something I'm missing to be able to display a view based on CiviEntities on an existing Drupal node? If you install the CiviCRM Entity module you can put Entity Reference fields on node types that can reference civicrm_case, civicrm_contact, and 40 other CiviCRM entity types. You can reference the data in Views, either individual fields or rendered view modes of the entity types. Your question doesn't quite make sense to me, so if you could elaborate about what you are trying to do a little bit or provide a screenshot or two, it could be helpful. You can definitely use and add Display Suite Blocks. 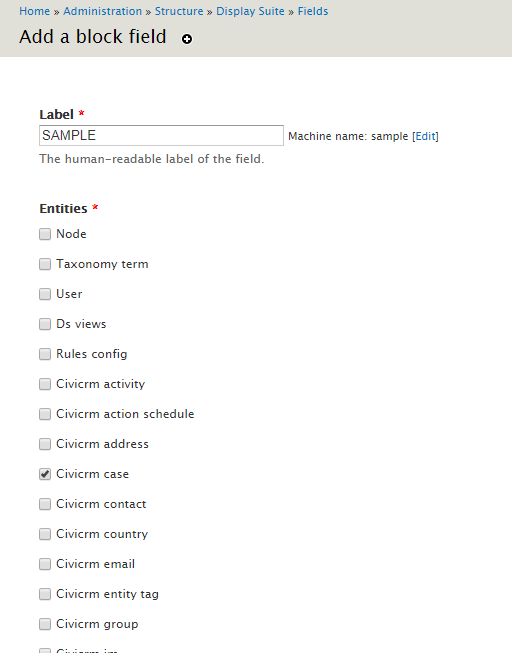 For instance, you can create a Display Suite block, check the civicrm_contact checkbox for the "Entities" field. Then down toward the bottom of the form, select which block you want to show on the Drupal contact pages, at paths, "/civicrm-contact/[contact_id]" where [contact_id] is the numeric id of a contact. You have to first add the block to the display of the contact page, the full content view mode, at "/admin/structure/civicrm-entity/civicrm_contact/display/full". To make the Display Suite Block available as a field, you have to enable a Display Suite layout for the full content view mode. You then place it in a layout region, and save, and it will show on all contact pages. I'm a bit confused what you mean by showing civi case or contact blocks on nodes..You can use entity reference fields to reference cases or contacts from a node, which would mean you wouldn't need to use Display Suite Block fields, or you can create Views base blocks listing cases or contacts, and then choose them in your Display Suite Block field settings, and check "Node" for the "Entities" field. Not the answer you're looking for? Browse other questions tagged drupal drupal-views civicrm-entity or ask your own question.